The U.S. managed to get a new video of Osama bin Laden before al-Qaida could release it to the world to mark the sixth anniversary of the Sept. 11 attacks. Soon after Washington announced it had the video, all the Islamic militant Web sites that usually carry statements from al-Qaida went down and were unaccessible, in an unprecedented shutdown. The reason for the shutdown was not immediately known. Evan H. Kohlmann, a terrorism expert at globalterroralert.com, said he suspected it was the work of al-Qaida itself, trying to find how the video leaked to U.S. officials. "For them this is totally disruptive that U.S. government could have a copy before their targeted audience does," he said. "They could be concerned and trying to plug the leak quickly." Another possibility is that the U.S. government shut down the sites, but that was unlikely, he said. "I don't think they would have the legal or technical capability to do so, to collectively shut all these sites at the same time. Also, I don't think the U.S. government is necessarily interested in shutting these sites down, unless there is something so provocative and dangerous in what bin Laden is saying." "It's pretty remote that the content of his speech is so incidienry that they would shut down all the sites. The idea that they (U.S. government) could totally prevent this from coming out on the Internet is ludicrous," he said. A U.S. counterterror official said several intelligence agencies were looking at the video but no details or conclusions about its message were immediate available. The official spoke on condition of anonymity because of the sensitivity of the issue. The White House said Thursday that any new video from bin Laden would serve to highlight threats the West faces. Analysts noted that al-Qaida tends to mark the Sept. 11 anniversary with a slew of messages, and the Department of Homeland Security said it had no credible information warning of an imminent threat to the United States. "I don't think that anything he is likely to say or do is going to change our resolve or the resolve of our international partners to confront extremism," Deputy State Department spokesman Tom Casey said. Still, bin Laden's appearance would be significant. The al-Qaida leader has not appeared in new video footage since October 2004, and he has not put out a new audiotape in more than a year, his longest period without a message. One difference in his appearance was immediately obvious. An announcement from al-Qaida's media arm had a still photo from the coming video, showing bin Laden addressing the camera, his beard fully black. 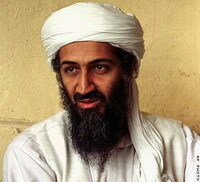 In his past videos, bin Laden's beard was almost entirely gray with dark streaks. Bin Laden's beard appears to have been dyed, a popular practice among Arab leaders, said Rita Katz, director of the SITE Institute, a Washington-based group that monitors terror messages. "I think it works for their (al-Qaida's) benefit that he looks young, he looks healthy," Katz said. The announcement and photo appeared in a banner advertisement on an Islamic militant Web site where al-Qaida's media arm, Al-Sahab, frequently posts messages. "Soon, God willing, a videotape from the lion sheik Osama bin Laden, God preserve him," the advertisement read, signed by Al-Sahab. Such announcements are usually put out one to three days before the video is posted on the Web. IntelCenter, which monitors Islamic Web sites and analyzes terror threats, said the video was expected within the next 72 hours, before the sixth anniversary of the Sept. 11, 2001 suicide hijacker attacks on the World Trade Center and the Pentagon. The anniversary has always been a major media event for al-Qaida - a chance for it to drum up support among extremists, tout itself as the leading militant group and show off its continued survival. "They've always gone out of their way to commemorate it," said Ben Venzke, chief executive officer of IntelCenter, which is based in Alexandria, Virginia. "Historically the anniversary of 9-11 has never been drawn to attacks. It's drawn to video releases." Whether the message will indicate a potential attack will depend on what bin Laden says, Venzke said. The White House said that any new video message from bin Laden would only underscore the threat the United States and other nations face from extremists. "Six years after 9/11, the arrests in Germany and Denmark this week and the battles we fight against al-Qaida in Iraq, Afghanistan, southeast Asia and around the world remind us of the continuing threat we face from extremists and why we must continue to take the fight to them wherever they are," said Gordon Johndroe, a spokesman for the National Security Council at the White House. Homeland Security spokesman Russ Knocke said Thursday that "there is no credible information at this time warning of an imminent threat to the homeland." But he said increased activity overseas and recent arrests of militants in Germany reinforce the department's assessment that the country is currently in a period of increased risk. If bin Laden does appear in new footage, it would be the first images of him since an Oct. 29, 2004 videotape, just before the U.S. presidential elections. In that appearance three years ago, he said America could avoid another 9-11 style attack if it stopped threatening Muslims. The new video would also end the longest period bin Laden has gone without releasing a message. His last audiotape was on July 1, 2006, in which he welcomed new leader of al-Qaida in Iraq succeeding the slain Abu Musab al-Zarqawi. Bin Laden went silent for a similar long stretch before - from Dec. 28, 2004 to Jan. 19, 2006. That absence sparked widespread speculation he was ill, wounded or possibly dead. There has been little such speculation since then. U.S. officials have repeatedly said over the past year they believe the al-Qaida leader is alive. He is thought to be hiding in the tribal regions of western Pakistan near the border with Afghanistan. During bin Laden's silence, his deputy Egyptian-born Ayman al-Zawahri has been frequently issuing videos and audiotapes. Al-Zawahri appeared in a 2006 video marking the 9-11 anniversary. An anniversary video in 2003 showed footage of bin Laden and al-Zawahri walking through mountain paths, with voice-over messages from both leaders.